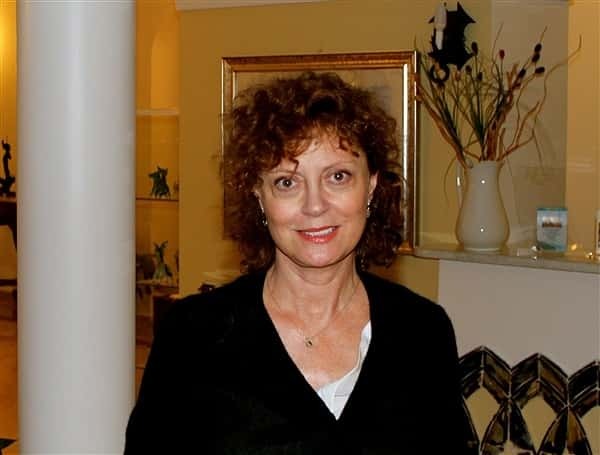 Susan Sarandon has come back "home"
Susan Saradon, the famaous american actress, has chose Ravello as a base, on the occasion of her visit at the Giffoni Film Festival, where she received the Truffaut's award for the career. The 64 years old star, that claims italian origins (her mother was from Ragusa) and an Oscar for the film "Dead Man Walking" (1996), has stayed for a week in a beautiful suite at the Hotel Caruso, in the company of her new younger partner, the thirty-two ping pong player Jonathan Bricklin. The Sarandon, who has been in Ravello several times before in the early nineties, hosted at Villa Rondinaia by Gore Vidal, the godfather of his son, has been often seen walking around the streets of the historic charming town, where she visited the VIP's jewelry store "Camo", to buy precious objects in coral. On monday, she took the opportunity to greet her friend Gore Vidal, back to Ravello for a visit of pleasure five years after the sale of Villa Rondinaia. Driven by the desire to review what has been his "Ithaca" for three decades, Vidal himself was accompanied to the Villa by his trustee. But, in the meanwhile that Sarandon, who wanted to buy a home five years ago but did not have the economic means, visited the rooms where it is said to have conceived her second child, the writer has preferred to stay in the garden, staring into that horizon which he called "the most beautiful in the world" and that he inspired some of his best works. Eyes covered by large sunglasses did not prevent the sense of feeling at that time persecuting the old tried and Vidal, unable to stay away from that environment by those scents, Ravello. In the evening, Susan Sarandon and Gore Vidal had lunch at the hotel Rufolo' s restaurant "Sigilgaida", while the day after both enjoyed the incredible fireworks displayed for the celebration of San Pantaleone, from Hotel Giordano's Sky Bar Lounge pool 's hosted by Giuseppe Palumbo.